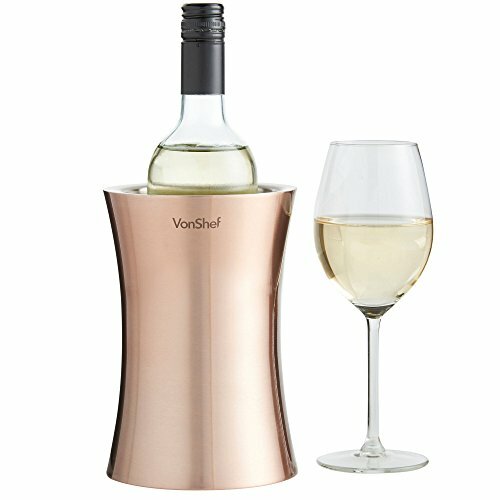 Convenient and Easy to use, simply insert your chilled wine into our VonShef Copper Wine Cooler- no ice needed! Save valuable fridge space and avoid making trips to the fridge all evening, this really is essential for any party or occasion. Don't settle for warm wine! This contemporary and refined design makes this a truly elegant piece that will complement any bar or kitchen. WINE COOLER: Keeps wine chilled. DOUBLE WALLED: Unique double wall construction for insulation. PRACTICAL: Ideal for home or professional use. STYLISH: Stylishly and elegantly designed, 7.8 x 5 inches with 4 inch diameter hole (approx.). COPPER FINISH: In stylish a copper finish.